In this tutorial we will show how to create images with PHP. Requeriments: GD library must be installed in the server (probably it is installed). Procedure: We will show small pieces of code, and the resulting figures. The code will be explained line by line. New lines will be added to the code so that the complexity of the image increases. Lane 2: request to execute function create_image(), which is located in lines 5 to 10. The function will create the image. Lane 3: print out the html code necessary to display the newly created image. The image is named "image.png". We have added to the end of the image a "?" and a value -date("U")- which will allow us to avoid to show images in the cache of the browse. date ("U") will add to the image name a number (seconds since 1970/01/01 00:00:00). As this number is different each time we create a new image, we will avoid the browser to show an image stored in the cache ones and again; the images "image.png?1034691963" and "image.png?1034691964" will be considered different by the browser, and they will be retrieved from the server. Lanes 5 to 10: contains the function which will create the new images. Line 6: $im is the variable which will be used to store the image. "@" is used before imagecreate() to avoid displaying errors (just in case). The first number is the width in pixels. The second number is the height in pixels. In case the image can not be created, and error is shown (die command). 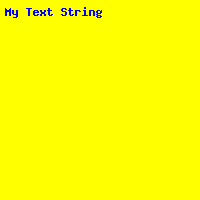 Line 7: We will define a color to be used as background color of the image, and a variable to contain it ($background_color). When using imagecreate() command in line 6, the first color defined will be considered as the background color of the image. In case imagecreatetruecolor() command is used instead, the background color will be black (but we may latter draw a colored square area with a different color and the dimensions of the image). amount of red: 255 (the maximum). amount of green: 255 (the maximum). amount of blue: 0 (the minimum). Lane 8: imagepng() will save the info at $im (the image) in the file "image.png". Other image types may be created by using commands imagegif(), imagewbmp(), imagejpeg(), or imagetypes(). In this tutorial we have selected png due to its open source nature. Lane 9: we have finish using the information at variable $im, so we will destroy it with imagedestroy() to free any memory associated to it. Lanes 9 and 10: new colors are added to the image (as explained earlier for line 7). Lane 11: horizontal line is draw. Lane 12: diagonal line is draw. 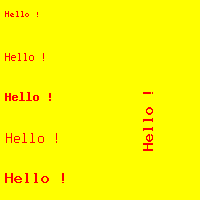 To draw lines imageline() command is used. Check the picture bellow to understand the parameters used with this command. where X1, Y1, X2 and Y2 are the positions within the image. 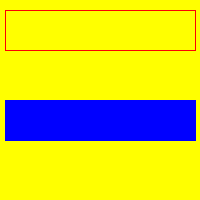 Lane 11: a red rectangle is drawn (only the outer line)..
Lane 12: a blue rectangle is drawn (a filled one). 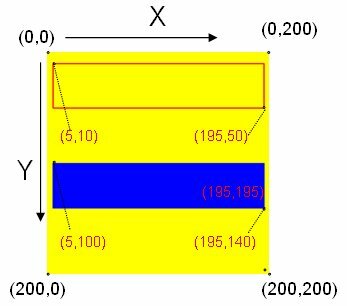 To draw the rectangles, position of upper left corner and bottom right corner are considered. Check the picture bellow to understand the parameters used with those commands. 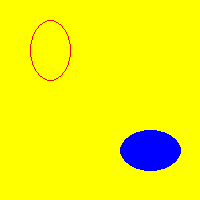 Lane 11: a red ellipse is drawn (only the outer line)..
Lane 12: a blue ellipse is drawn (a filled one). To draw the ellipses, position of the center of the ellipse, and its width and height are considered. Check the picture bellow to understand the parameters used with those commands. 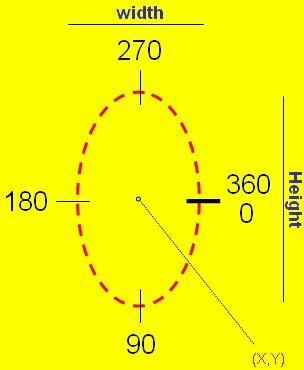 To draw a circle you may draw an ellipse with width=height. Lanes 12-15: a red arc is drawn (only the outer line).. Lanes 17-20: a blue arc is drawn (a filled one). Width and height are the dimensions of the complete circle formed by the arc. arc start and arc end are the start and the end of the arc in degrees. If start is zero, as in the example, the figure will start in the right. Flags are specific options available for those commands. Visit the commands information to get additional information about all possible flags. Check the figure bellow for better understanding of the commands above. 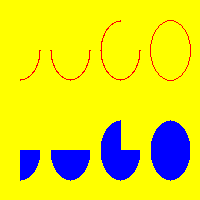 The commands imagearc () and imagefilledarc () may also be used to draw circles (width=height, arc start=0 and arc end=360). Lanes 10 to 14: adds text to image. 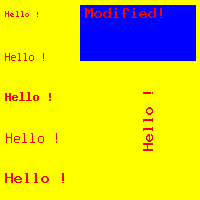 In this simple example, built-in fonts will be used. The size will be 1 to 5. 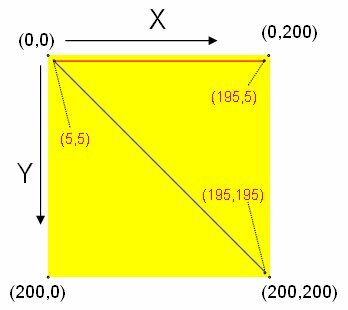 X and Y are the positions where the text will start. Lane 16: similar to previous lines, but text is written in vertical. Lane 3: the information about the image is stored in variable $im. In this case, the information has been obtained from an existing png image with the command imagecreatefrompng (). degrees are used to define the rotation angle. Values may be positive (90, 180...) or negative (-90,-180...). $color indicates the color to be used as background when necessary (when rotation angle is different to 90, 180 and 270). For example when rotation is 45 degrees, the size of the figure will be altered, as shown bellow. As a consequence a background color is required to fill the new surface. 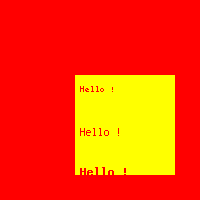 In this example, we have define the background color as red. Lane 6 and 7: the image is saved to a file and frees memory (as described in code 1). Lane 9: Both images are shown (original and new). Lane 3: the information about the original image is stored in variable $original_image. 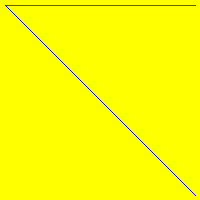 Lines 6: size of original image is obtained. The info is contained in an array as explained in the code. Lanes 10 and 11: width and height of the image are extracted from the array and stored in variables $width and $height. Lanes 13 to 15: In this example, the image will be reduce to 70%, so new width and height are computed as shown. To avoid decimals round command is used. Lane 17: In this line starts the creation process of the new image. Command imagecreate() will define the dimension of the new image, and variable $new_image will store all information related to the image. Lane 18: This is the core command of this script. Lets try to explain the command by using a picture which contains all the elements in the command. Lane 20 and 21: the image is saved to a file and frees memory (as described in code 1). Lane 23: Both images are shown (original and new). Lane 4: the information about the original image is stored in variable $original_image. Lane 7: a new 200x200 pixels image is created. Lanes 12: The core command of this script. A square area from original image is selected. 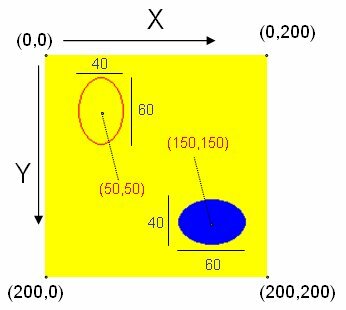 In this example, the selected area is defined by position (0,0) and position (100,100). 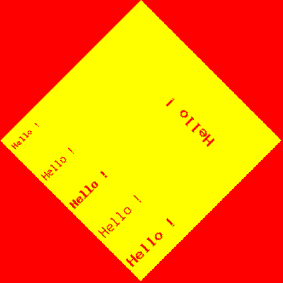 The selected area is copied to position (75,75) of the new image and dimension of the area are maintained (100x100). Lane 14 and 15: the new image is saved to a file and frees memory (as described in code 1). Lane 17: Both images are shown (original and new). Lane 4: a new image is created using an already existing image as a reference. Lane 13 and 14: the new image is saved to a file and frees memory (as described in code 1). Lane 16: Both images are shown (original and new). Lane 3: In this example, the first information send by the server to the browser is shown in line 3. 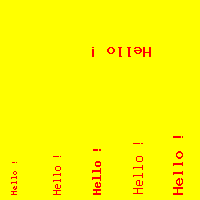 This line indicates that information being send is a png image. Lane 9: a text is added to the image(as described in code 6). Lane 12: the image is output. As no file is indicate, the image is output ("on the fly").